The molting process concerning insects is one of its more fascinating qualities. Molting is the process by which insects grow. Generally accomplished through the early years of the insect's existence, molting allows the body of the insect to expand under controlled and protected conditions. In comparison, our (human) bodies expand with the growing of our bones and muscles as we age. Insects, on the other hand, utilize what is called an exoskeleton. This exoskeleton is basically their underlying bone structure that is located on the outside of their bodies with corresponding organs and muscles located underneath this hard shell. So in order for the insect to grow - i.e. increase in size - the insect must shed its current skin in favor of the new skin underneath. This process is known in the insect world was molting. To undergo the process of molting, an insect must begin to take in air or water by either swallowing it in naturally or raising its internal blood pressure. This instigates the process of molting that begins. The result is a soft, expandable exoskeleton suitable for further, albeit limited, growth. This process is repeated several times during the life span of an insect depending on the species. The new exoskeleton will eventually harden and retain the original coloring of the insect as it matures and is exposed to the elements and everyday wear-and-tear. Depending on the species, molting can actually occur about 5 to 60 times in the life span of an insect and is generally regarded as one of the most vulnerable processes that an insect can go through. Yet this process is naturally required by insects to continue to grow into a full adult stage. Not surprisingly, molting is not limited to insect species alone as even spiders and snakes undergo the procedure as needed. 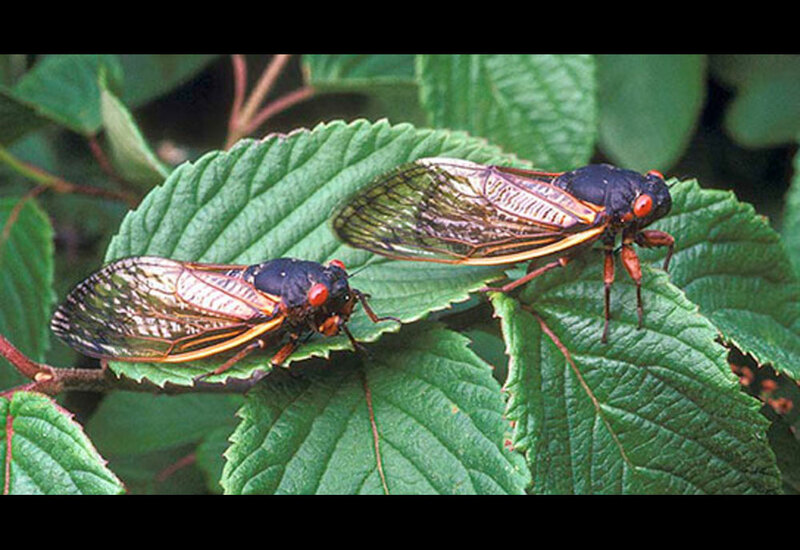 With 2008 having been the "Summer of the Periodical Cicada", the timing was perfect to receive these spectacular images of the Cicada molting process as submitted from Darla M. of Lancaster, New York. These images show clear detail of the entire process and offer up a glimpse into a world that few of us ever stop to admire. So, with a special thanks to Darla for making these images possible, enjoy them on behalf of www.InsectIdentification.org (photos courtesy of Darla M. of Lancaster, NY). BUGFINDER allows for a quick search of the Insect Identification database by selecting primary color, secondary color, number of legs and the territory / state in question. If only one color is present on your insect, select it again as its SECONDARY color. Remember that the more details you can offer, the better your chances of finding a match. Unless your specimen is missing legs, insects have six legs whereas spiders have eight legs. If it has more than 8 legs, it is neither an insect nor a spider. ©2016 www.InsectIdentification.org • Content ©2005-2016 InsectIdentification.org • All Rights Reserved • Site Contact Email: insectidentification at gmail dot com. The InsectIdentification.com logo is unique to this website and protected by all applicable domestic and international intellectual property laws. Material presented throughout this website is for entertainment value and should not be construed as usable for scientific research or medical advice (insect bites, etc...). Please consult licensed, degreed professionals for such information. By submitting images to us (InsectIdentification.org) you acknowledge that you have read and understood our Site Disclaimer as it pertains to "User-Submitted Content". When emailing please include your location and the general estimated size of the specimen in question if possible.